Q-What is a Beck CREW Cover? Answer-A Beck CREW cover is defined as a Beck printed cover without the B number. 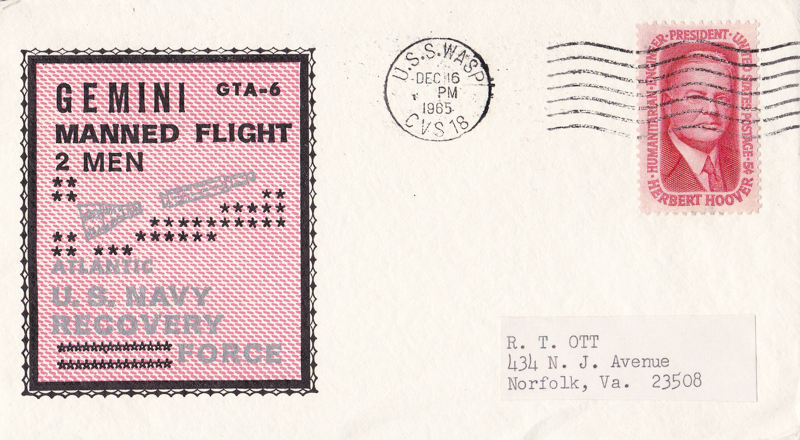 envelopes were sent to the Navy for their use. See an example of a Beck CREW cover below. Note that there is no B number. The 25 envelopes Beck sent did not have, postage stamps, addresses or the "B" number printed on the cover. 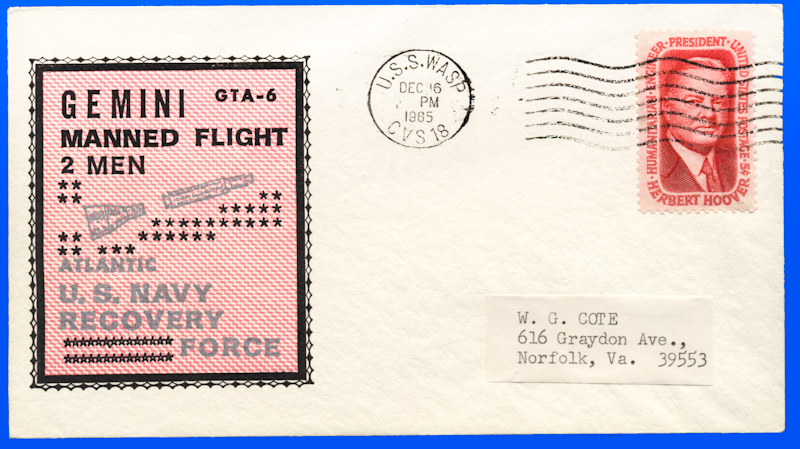 The 25 covers were a gift from Mr. Beck to the Navy for handling the batch of collector's covers Beck sent to the Navy's coordinator for cancellation. Beck intended the covers to go to the Senior CREW or VIPs, but Beck really didn't have control on how the covers were distributed. This is why it is called a CREW cover. Q-Some Beck CREW covers have a rubber stamped address. Does this mean that some collectors sent his own envelopes to Beck and requested CREW covers? Note the rubber stamp address on the cover shown below. The address had to be applied by the collector. Then Beck printed the CREW cachet, probably by special request. Q-Whom at the Navy did Beck send the covers for postmarking? A-For each of the two Task Forces, (Atlantic and Pacific), the US Navy had coordinator personnel. See the separate newspaper article naming Chief Skelley. Beck did not send his batch of covers for each ship directly to the ship. He sent them to the coordinator. For most flights, the US Navy assigned a Task Force coordinator for each ocean (TF130 or TF140). 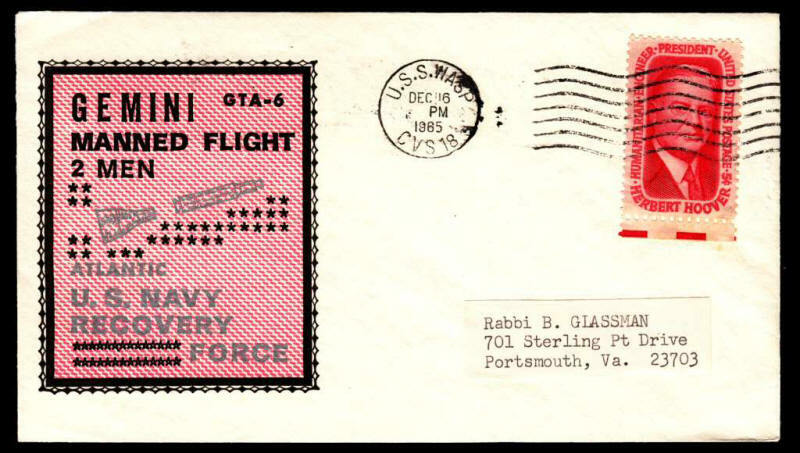 See the articles below for an example of how the US Navy handled the covers from collectors and dealers. 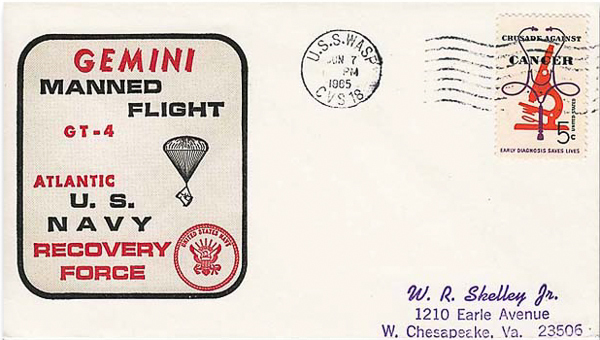 Chief Skelley was very active in collecting covers and probably accommodated many special requests from collectors. 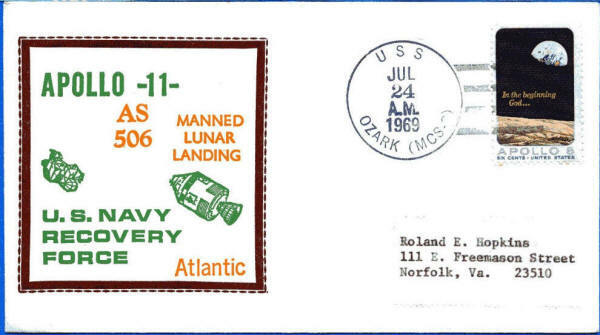 We know from Beck's correspondence that he sent the printed/cacheted envelopes in a batch or group of covers for as many recovery ships that he understood there would be. We believe that any special requests from collectors including the special requests from Europe were in a batch and marked as such. The coordinator hopefully would send the batch to the designated ship. Q-What is the so-called VIP Label? 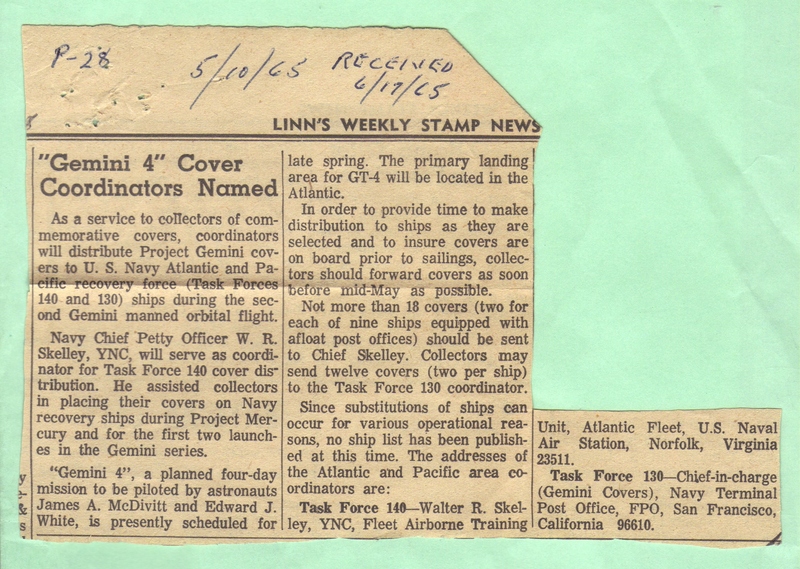 A-The coordinator sometimes (or perhaps the ship staff) sent the CREW or printed "B" covers to select VIPs that were "centers of influence" for the Navy or Space program. Here are some examples of Beck covers with the VIP label (applied by the coordinator or Navy). Beck did not apply the VIP labels. Q-Did any crew members provide a similar service to collectors as Morris Beck did, parallel to Beck or more probably working together with Beck, in the same way as in regard of the regular covers? A-We don't think so. We've never seen reference to this in advertising or correspondence. Other cachet makers such as Robert Ekas printed their own cachets. Q-How can there be a CREW cover with a rubber stamp address? 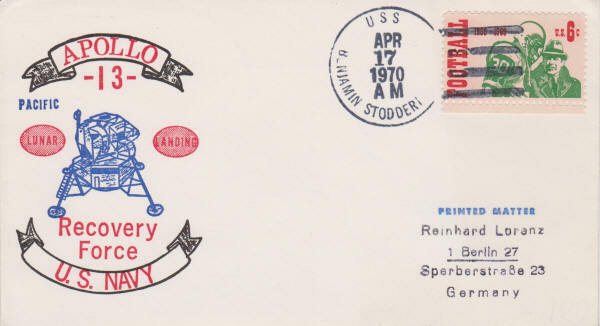 A- (Answered by Andre Gutmann) The 1967 USCS Log Advertising explains that collectors should send Beck the franked covers with the return address on the covers. There would be no other way for a cover to be addressed with a rubber stamp without being supplied by a collector. Beck would take these covers (envelopes) and print the cachets on them, either regular cachet with number or CREW cachet without number. 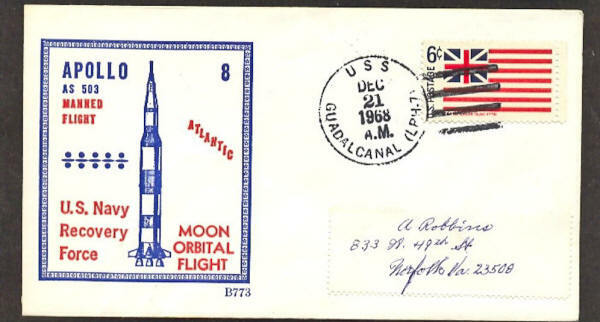 In the case below where the address is a rubber stamp of W R Skelley, the answer is simply because Skelley was the Navy's coordinator of the space covers. He simply used the CREW covers he received from Beck. 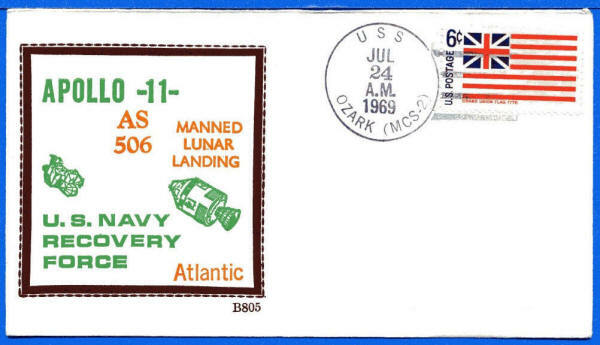 Q-How many CREW covers exist for each space flight? A-We don't know for sure. The only reference to this is Beck printing log that states that 25 CREW covers were sent to the Navy for EACH batch and/or BXXX number. 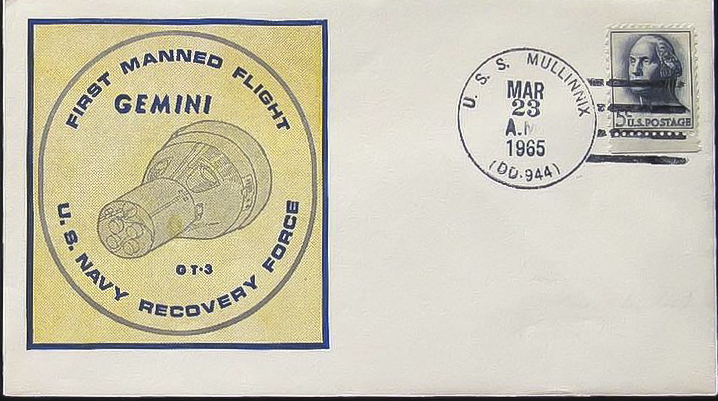 We don't know if the several special request for CREW covers was in addition to the 25 or included in it. Q- Are the printings without B-number happened by accident? Q-Did you ask Mr. Beck these questions? A-Yes, we did. In 2005, we had extensive correspondence with Mr. Beck to ask him many questions. Unfortunately, due to his age, he couldn't remember many details from that long ago.. So basically, we have tried to piece together what information we learned over the years. Mr. Beck passed away in 2011 at 85 years old. 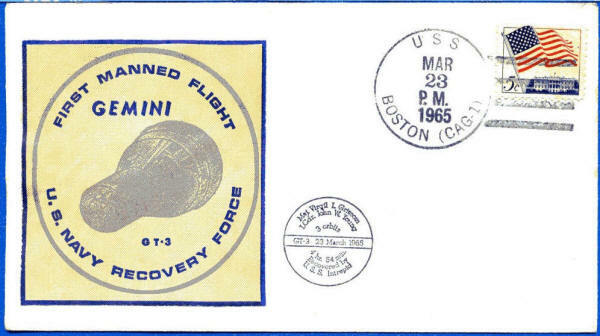 Early in the Gemini program, Beck gave up trying to find out the exact names of all the ships on a recovery mission. 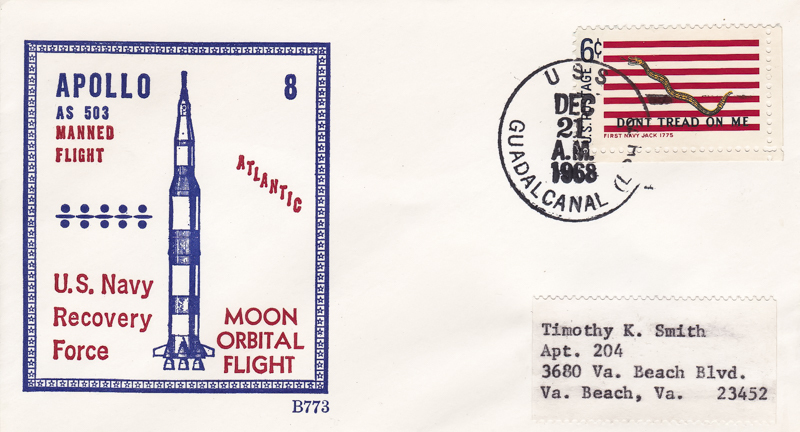 simply says GT-3 or Apollo 8 Pacific, etc. 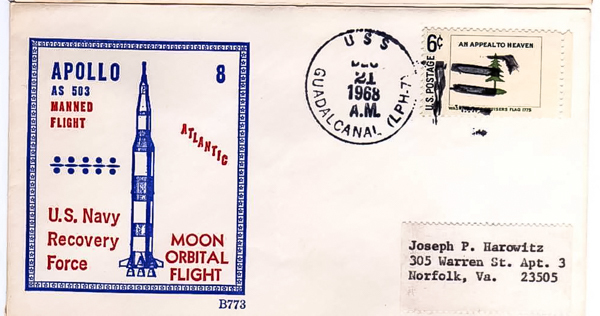 stamps and without address). 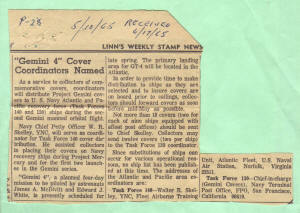 The Navy coordinator then took the covers and distributed them to the ships or VIPs. The distribution method was different from flight to flight. There didn't seem to be a consistent method for the distribution and that is why we see several ships with the same Beck cover number. We have no idea what happened to all the CREW covers Beck sent. Sometimes they were sent to the secondary ships and perhaps (guessing only) they were all sent to the prime recovery ship. Below are two examples of Beck Ozark covers. the number in the series of 1000.
as an official secondary recovery ship. 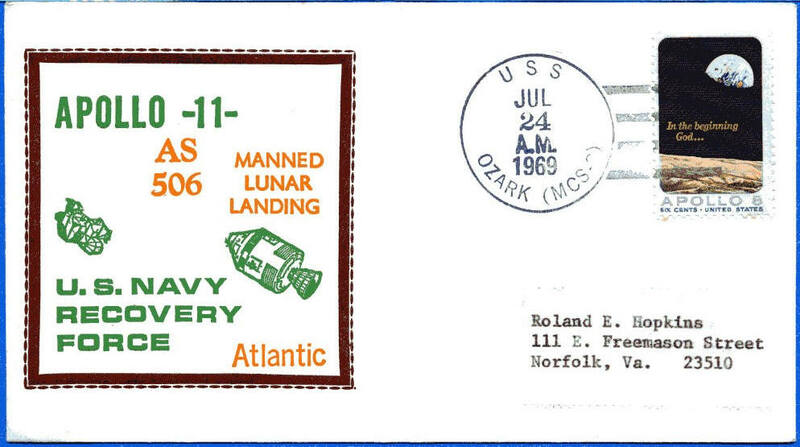 So somehow, someone had the cover and had it postmarked. Another explanation is that Beck may have given some blank CREW covers to various collectors upon request. I asked him this question but it was too long ago for him to remember the details.